The Place of Forgetting by M.A. Packer is something of an odd product. If you had to categorize it, it would be an adventure module, but it's really more an outline of a campaign than an adventure. And not your standard campaign, something more akin to Diablo (the computer game) than anything else, though more with an undead than demonic theme (though it does have demons). Essentially a neighboring kingdom has been taken over by a demon prince and the inhabitants have been turned into undead and other evil monsters. The PCs go there, kill everything they encounter in one area, progress to another, repeat, until a final showdown with the demon lord. Each area has no map or anything, but does have a description, encounter tables, and a few keyed entries that are points of interest. 15 of these locations in all, plus something of a home base. While sketchy, what's there is quite evocative. You have ruined fields, haunted forests, a couple of towns full of the dead and undead, and then finally the capital city which is divided up into several different zones. While there is no map included, you can almost see a CRPG style overland map as your read the product. Lastly there are 25 new monsters and then a handful of "boss" encounters. These are all generally undead or related icky things. Many of them tend to explode when killed. The bosses are probably the highlight. You have a cannibalistic butcher, 4 dread horsemen, a giant zombie with no legs that vomits zombies, some lesser demons, and then the final boss, a demon price. While the outline of the campaign is sketched out, I have doubts that it's actually feasible to run one in practice. 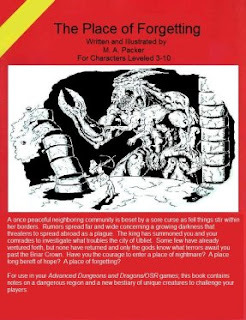 In 1st Edition in particular, most of the experience comes from loot, not killing monsters. Something like 66% loot, 33% monsters in my experience. And in a ruined kingdom generally isn't loaded with loot. While the monsters included do have a suggested treasure type, that's generally only for monsters in their lair, while most here seem to be encountered randomly. It's about as basic a PDF as you get. Single column, but normal sized type, so reads like a book report or something. There's a couple of illustrations apparently done by the author. Not bad, I've seen worse from professional artists. I'm not sure many will use The Place of Forgetting as intended (I mean, it would be nice if it were fleshed out more, but it's only $2), but it's certainly something that can be mined for useful ideas and grotesque encounters. And it's an interesting read, the descriptions of places are really well done. I think if you really want to use it, you might also use the 2e Diablo II sourcebook (which is surprisingly decent, BTW).